See the end of this post for specific answers to the questions posed by the RANTER. As a freelance indexer/copy editor/house and cat-sitter, I’m house/cat-sitting in San Marcos, CA, north of San Diego (just south of Hwy78 and between I-5 and I-15). Two fires that started on Monday in San Marcos were under control the next day, but fires still rage north, east, and southeast of here. Smoke was very thick and left layers of ash on everything on Monday and Tuesday; the air quality was better on Wednesday and much, much better today, so much so that I couldn’t smell the smoke. Was I frightened? No, for I face challenging situations with calmness, remaining alert for news and announcements that would affect me. However, I was prepared for evacuation if the order was issued. I’ve communicated with the home owner and have items she’d emailed me to save packed in my car along with almost all of my possessions. Although I’d had to keep the indoor/outdoor cat indoors (sad cat) for three days, I’m now allowing him outdoor privileges (happy cat). 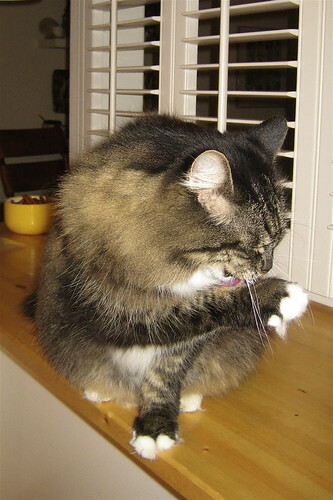 Shelley maintains his personal cleaning in spite of the trauma of having to stay indoors. I’m continuing to work on my current indexing project each day and luckily have had only one brief power outage. I drive to the local It’s A Grind Coffee House to send/receive files. Watching the news is heart breaking especially knowing that only a whim of Mother Nature kept my area fire-free. R: Have you seen flames? R: What is the mood of the city? J: From what I’ve seen, everyone is obeying directives, but they appear in a solemn mood. I haven’t been hearing any laughter. R: Is the smoke affecting you? J: Only slightly, but eyedrops solve the problem. R: Are you taking pictures? R: Did you take my ex-girlfriend’s advice and pack everything in your car incase (sic) you need to beat a hasty retreat? J: If the ex-girlfriend is my older daughter (the one you are married to), then the answer is yes. In case I need to “beat a hasty retreat,” my car is packed. However, if the ex-girlfriend is someone other than my older daughter, I did not receive her message. R: Are the fires affecting the southern California mango crops? 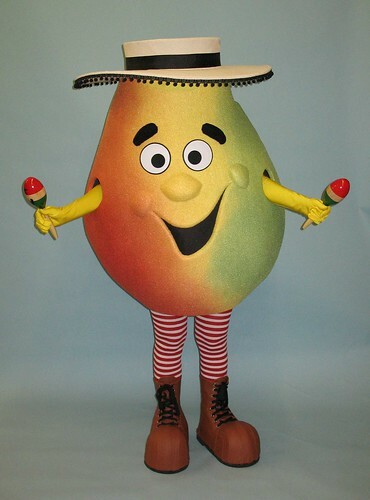 J: Because the National Mango Board marketing director (my younger daughter) is on vacation, I was not able to get an answer about the California mango crops. I’d suggest that you consult Jango Mango who is making his debut tomorrow, Friday, October 26.
of thousands of people have been displaced, their homes burned to the ground. things will soon get even worse. And yet what do we, your avid readers, hear from you? you if you will not quench our thirst for information? retreat? Are the fires affecting the southern California mango crops? Inquiring minds want to MUST know!